Unfortunately, matching those standards was a losing battle right from the get go, mainly due to the setting. Newcastle's O2 Academy is a typical chain venue. It's a competent mid-capacity room which does little more than serve its purpose, providing nothing which adds to the events it stages. At 2000 capacity, it certainly lacks the intimacy in which Hawley's music thrives, but that alone is no excuse for some of its less tolorabhle inadequacies. In fact, the sound of loose change clashing at bars and that of security men's walkie talkies did nothing but detract from the experience; an issue which coupled with a relatively inattentive crowd could have made for a fatal cocktail during some of the night's sparsest moments. Luckily, the scope and magnificence of Hawley's live show is such that it can ride out and at times even paper over such inconveniences. Downing the talkers early on ("you must be rich around here if you can afford to go to concerts and talk all the way through"), the Sheffield-based songwriter went on to deliver another masterclass which had all those listening in a state of appropriately wide-eyed wonder. With such a dazzling retro-tinged catalogue at his disposal, it's little surprise that his setlists are exemplary, but even so the grace and majesty of his performances are nothing short of astonishing. Every song is a glorious highlight in its own right, be it the shimmering reverb-drenched contemplation of "Soldier On," the gentle, progressive beauty of "Remorse Code" or the raucous psyche rock tremors of "Down In The Woods." Flawlessly conceived and superlatively executed, it truly is a pinnacle to which all other musicians should aspire. For the sake of comparison, tonight didn't quite match his exploits in Whitley Bay, but the fact it sits comfortably in second place on my annual list in spite of all the hindrances speaks volumes of what a stunning live proposition Hawley has become. These appearances are a spectacle for which everyone involved deserves credit - the note-perfect backing band, the tasteful visual designers, the crystal-clear sound engineers - one can only hope they're well paid; by God they deserve it. 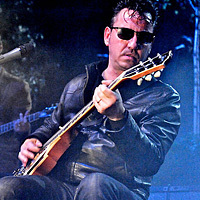 You don't need to own any of Richard Hawley's records to be blown away by one of his gigs. You don't even need to have heard of him. All you need is a date nearby and a paltry £20 in your back pocket. You'd be a fool to miss out.